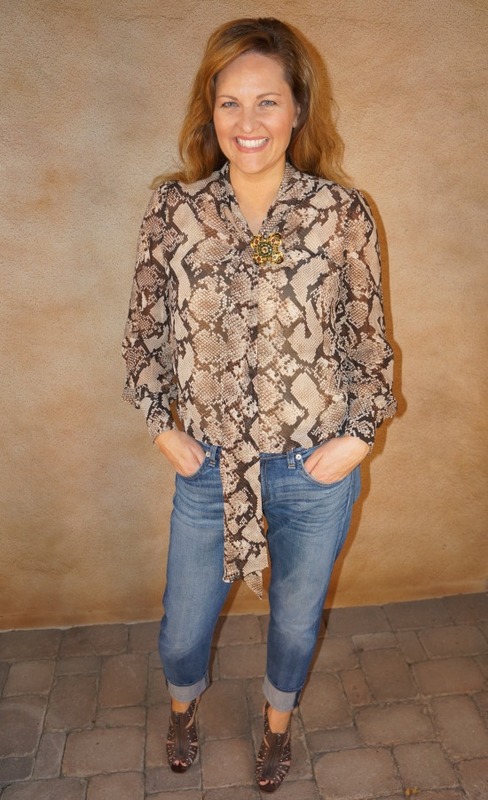 Our obsession with the Altuzarra for Target collection continues… Today, Angela is working the exotic python-print blouse and going from press meetings to school pick-up with a quick change of pants and accessories. There are so many ways to style this top! It also makes a great layering piece under a sleeveless sheath dress or crew neck sweater. Share your Altuzarra for Target finds and how you’re wearing them with us!! Email us your photo or tag us @momstylelab on Facebook, Twitter, Pinterest or Instagram. We’d LOVE to see how you’re wearing yours! The ladylike bow paired with tailored tweed trousers screams sophisticated and professional for work. Add rich chocolate-suede booties and a gold-tone cuff to complete the look. Loosen things up by untying the bow and switching the trousers out for boyfriend jeans. Add a brooch and studded booties for street-style-star flair.